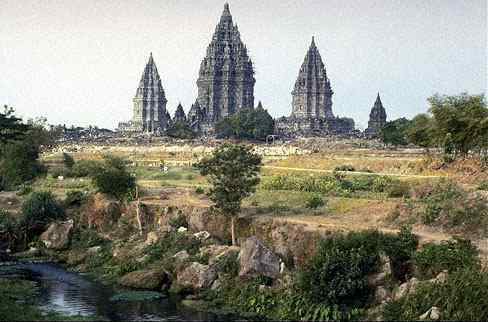 Prambanan Temple ( also known as Lorojonggrang Temple ) was located at Bokoharjo Village, Prambanan, East of Yogyakarta (Indonesia.) The temple is believed to have been built by King Balitung Maha Sambu in the middle of the ninth century. This temple is dedicated to the Hindu God Shiva, locally called Candi Loro Jonggrang, which means 'slender virgin.' From an architectural point of view this beautifully sculptured spire, fifty meters high, indeed resembles a 'slender virgin.' Like the Buddhist stupa Borobudur, Prambanan was abandoned when the Buddhist and Hindu Javanese inhabitants moved to East Java.